Let your voice be heard. It is everyone’s civic responsibility to vote. Any citizen of the United States over the age of 18, a resident of South Carolina and will be 18 years of age by the day of the next General Election, may vote in any Federal, State and Local election. The City of Aiken Election Commission is responsible for the preparation and conduct of the elections and for the verification of election results. The Aiken County Board of Voter Registration Office maintains the current registration and elections process for City of Aiken voters and meets mandatory state and federal standards. The Office also provides convenient ways for City residents to register to vote, update their voter registration record, vote by absentee ballot, and pursue their candidacy for office. Political Yard Signs may not be placed inside the public street right-of-way. Political Signs may not exceed three square feet in Residential, Planned Residential, Limited Business or Limited Professional zoning districts. Political Signs may not exceed 32 square feet in other areas of the city. There is not a restriction on when Political Signs may be erected, but they must be removed within 15 days of the election. If left up, or put within the street right-of-way, the City will remove them and place them at a determined location for the candidate or their representative to reclaim. 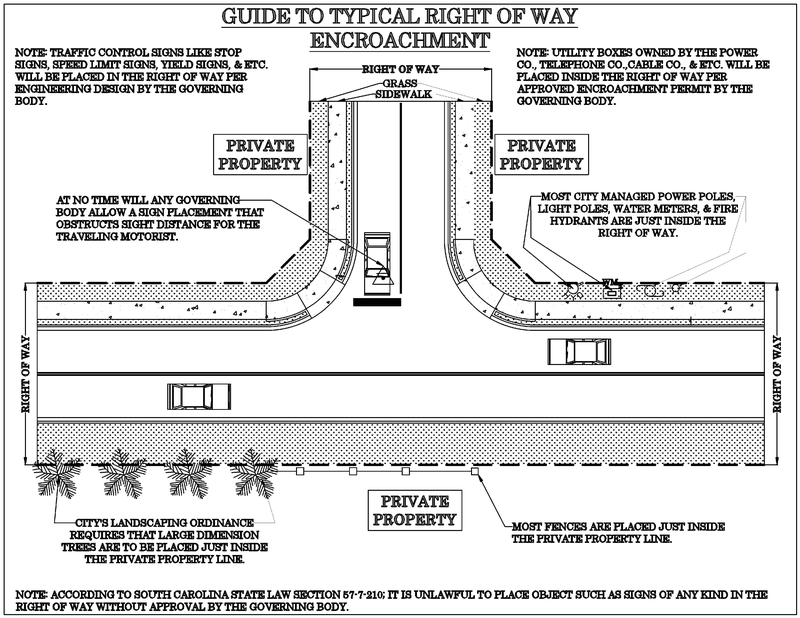 The right-of-way can usually be defined as being outside a line defined by water meters. Also the line of utility poles is often a good marker, but less accurate than water meters. In cases where the right-of-way abuts a private wall, fence, or hedge, and political sign must be placed flt against such wall, fence, or hedge.